Dear White People: Stop Telling Black People Their Experiences Are an Illusion | Jacqueline Ryan Vickery, Ph.D.
We have a major problem with racism in this country. My 140 character Twitter rants and two paragraph Facebook posts are no longer enough. More needs to be said, so here we go. I know many of you will read this and immediately relate and understand and nod your head in agreement. However, I know others of you will not even make it all the way through this or you will get defensive and refuse to really listen. But I’m asking you to just try, for a moment, to put down your guard, and truly listen. The thing is, I shouldn’t be the one you are listening to when it comes to racism and discrimination and injustice in this country. However, I know that my white skin allows me to say things and be heard in spaces that others cannot and are not (it’s called white privilege). And before you get all upset, no, there’s nothing wrong with being white. And no, I’m obviously not saying all white people are racist. I am saying we live in a society that makes me feel more comfortable speaking out about issues of racial discrimination than others, because I feel safe. I’m not afraid that I’ll be accused of playing the “race card”. I’m not afraid of being labeled just another “angry black woman”. I’m not the one you really should be listening to here, but, if you aren’t willing to listen to black people when they tell you they are being discriminated against – then listen to me, a privileged white college professor who looks like you and your wives and mothers and daughters, who has shared experiences as you – listen to me when I shout: RACIAL DISCRIMINATION IS REAL! Rather than dismissing accusations of discrimination, rather than looking for alternative explanations, rather than rolling your eyes at “political correctness” and “racial politics”, how about you actually LISTEN to people of color share their experiences, their stories, their heartaches, their fears? Listen to the ways they negotiate precarious situations EVERY. SINGLE. DAY. Listen to my students explain that they “act white” to be respected by their bosses. Listen to the young black man in my class tell me he never drives more than a mile over the speed limit because he is TERRIFIED of how that might go down if he gets pulled over. Listen to the heartache and fear of black moms and dads everywhere who mourn for the loss of another black child at the hands of an adult in authority in this country. If you don’t understand, ask. If you are surrounded by people who look like you, well, then get online and deliberately seek out voices from black communities (and not just athletes and celebrities!). Read black news. Read black blogs. Get on Twitter and listen to black community leaders. 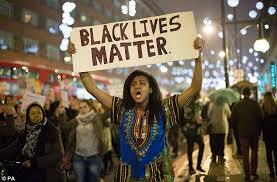 Follow the #BlackLivesMatter hashtag and #ICantBreathe and #IfTheyGunnedMeDown. Listen to black politicians, black civil rights activists, black journalists, black scholars, black feminists, black authors, queer blacks, black youth – read and listen and learn. Also, recognize that these are spaces in which your voice and your opinion is not solicited and not needed and that’s a-ok! Just listen and learn and empathize. You can’t relate firsthand, so learn from those sharing their very real experiences. Do not dismiss and disbelive another’s emotional response and perception just because it is not yours. Like anyone, I hate being pulled over. But you know what, my biggest fear is that I might get a citation (that I deserve). I’ve never been afraid that I would be arrested for questioning a police officer. As a teen, I was never afraid that someone in my neighborhood would call the police because I “looked suspicious”. And as an aunt, I don’t fear that my 12 nieces and nephews will be physically assaulted by an officer at a pool party or in their classrooms – no matter how disrespectful they might be – I trust that their behaviors will be addressed in a way that respects them as human beings and not as “thugs”. If they are breaking the law, I trust that they will be granted the right of due process, rather than an officer acting on behalf of a judge. These are privileges – and rights – that far too many people in our country are being denied. But really, I don’t want you to take my word for it. In fact, I wish I didn’t feel the need to write this because what I really want is for you to BELIEVE black people and other marginalized populations when they tell you they feel threatened. Believe them when they say they are AFRAID and SUFFER FROM DISCRIMINATION. Believe them when they feel that they are being profiled and treated unfairly. Their word is enough. Period. They don’t need white people like me to validate their voices and experiences – but as an ally, I cannot sit by quietly watching far too many white people in my networks discredit their experiences & justify racial injustices. I have to call you out or I’m part of the problem too. Your lack of shared experience does not invalidate their experiences and is not justification to dismiss their perspectives. 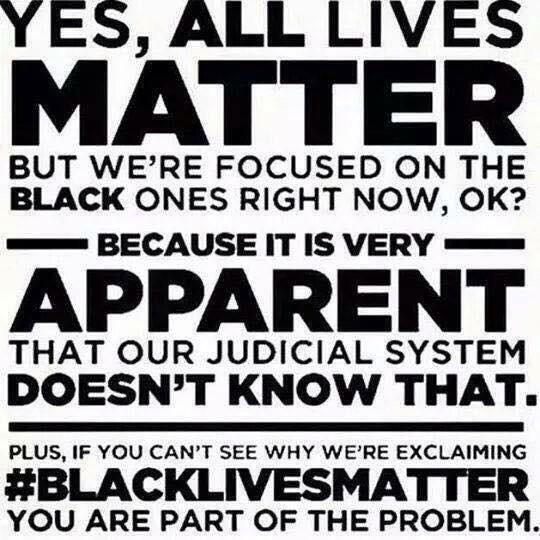 And if you really don’t understand, I’m guessing it’s because you do not know many people who are affected by systematic racism in this country. I hear story after story after story in my classroom of students of color sharing their realities, perceptions, and legitimate concerns about being black (Latino/a, biracial) in today’s world. I hurt for them. I’m angry with them. I offer support if they want it. But most importantly, I believe them. Period. I have been reluctant to write this because I know my voice should not be needed. I’m not saying anything that blacks in America haven’t been shouting for centuries. But I see far too many white people dismissing, silencing, and criticizing their voices. Perverting justice away from holding perpetrators and violators accountable, and instead looking for ways to justify their inexcusable actions. Justice is never about finding a reason why a victim deserved brutality. No, enough is enough. A defiant teenager with a phone in the classroom is not a physical threat to anyone. Nothing justifies throwing her body across the room. Nothing. Did you hear me? Nothing! Quit justifying it. And quit erasing the racial aspect of this. We know – statistically know – that blacks are disproportionately the victims of police violence and threats, and are disproportionately incarcerated & face harsher sentences than whites. I mean, Dylan Roof killed 9 blacks at church and was peacefully arrested. The girl at Spring Valley was guilty of being distracted and a distraction in class and was physically assaulted. And no, not all cops are bad. But good cops don’t negate systematic problems. As one of my former students said on Facebook, “we don’t tell a victim of domestic violence that ‘at least he buys you flowers sometimes.’” Changing the conversation to the good cops further distracts us from actually addressing the problem. Reminding us that there are good cops is just a way to make you feel more comfortable by deterring the conversation away from the very real fears and experiences blacks are making visible – and we need to do that even if it makes us – white people – feel uncomfortable. 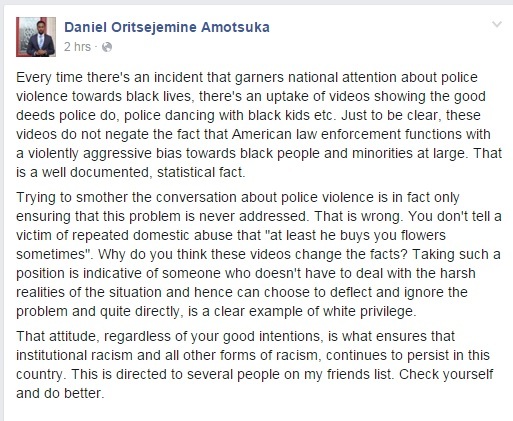 Daniel’s Facebook post from 10/30/15 – shared with his permission. My point is – we, white people – must stop dismissing, distrusting, disbelieving, deterring, and silencing people when they tell us they feel disempowered, discriminated against, angry, and scared. Whether you want to believe this is about systematic racial injustice or discrimination or not (it is! ), you at least owe it to your fellow black citizens to understand why they feel the way they say they feel. Their feelings are as valid as yours and your lack of experience and understanding does not give you the right to discredit their experiences and understandings. Your perception does not trump theirs. When you hear someone say, “I feel discriminated against” or “I don’t feel safe” or “This is racially motivated” your first response should be empathy. Your second should be to understand why they feel that way. And your third should be to check yourself and make sure you are not intentionally or unintentionally contributing to someone else’s fear, concern, disempowerment, or right to safety and opportunity.